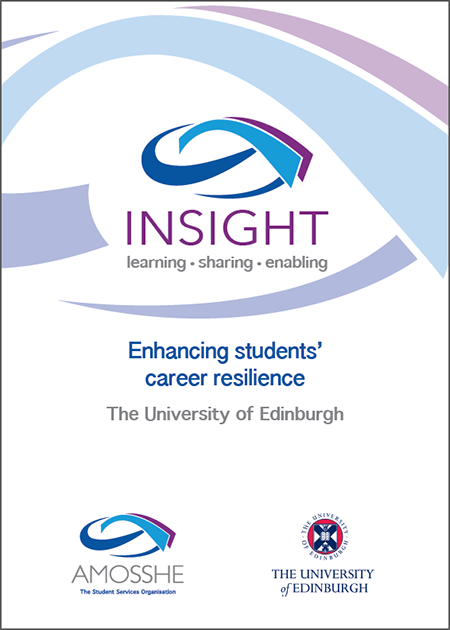 This project, undertaken by the University of Edinburgh, aimed to explore ways to help and encourage students to develop the tools of career resilience, to deal with the pressures and stresses of a highly competitive graduate labour market. Project leaders: Helen Stringer, Assistant Director, Careers Service, University of Edinburgh, and Lynsey Russell-Watts, Careers Consultant, Edinburgh College of Art. Total award from AMOSSHE: £2,002. An acknowledgement that students face a highly competitive graduate labour market, due to increased supply of graduates combined with a global economic downturn. In the UK, this is compounded by housing market pressures and the altered fees landscape. An observation based on practice experience that students often seem to be poorly equipped to deal with these pressures and stresses, for reasons the project aims to explore in its initial stages. A concern that while students are often urged to ‘be more resilient’, there seems to be little in place to empower them to achieve this. Explore the factors affecting students in a careers context, as outlined above. Establish commonalities and discrepancies between staff and student perceptions of resilience, and related concepts such as failure, perseverance, determination, optimism, realism, and so forth. Develop practical interventions (for example, workshops) to enhance students’ resilience. Walker et al (2006) have demonstrated that it is both possible and desirable to design learning experiences that foster resilience. Workshops could be based on a number of different strategies (informed, for example, by narrative-constructivist theory, cognitive behavioural therapy, motivational or solution-focused approaches, and by the work of Bimrose and Hearne (2012) on career adaptability). The initial research was therefore designed to gain a fuller understanding of the problem in order to develop and evaluate appropriate interventions. Within the project, interventions took the form of discrete workshops in order to better isolate and assess their impact and effectiveness through questionnaire and interview, but the project outcomes also include recommendations for tools and strategies that could inform pre-existing interactions with students, whether career guidance interviews, teaching, or personal tutor sessions. The final stage of the project assesses and reflects upon the workshops, in order to make recommendations to those working with students throughout higher education who have an interest in developing students’ ability to respond to failure or setbacks. A literature review examining the intersections between resilience and careers, and any practical strategies for developing resilience that have been developed elsewhere. Focus groups with current students exploring their ideas and experiences of failure, resilience and perseverance, and how resilience in the face of career setbacks could be fostered (probably three groups of eight participants, drawn from penultimate year UK students). At this initial stage, the project team were primarily concerned with students’ experiences of the UK job market, while aware that international students may have different cultural approaches to and understandings of resilience. Many penultimate year students are beginning to focus on their careers post-graduation, and may have exploratory experiences of the graduate job market through applying for internships or similar. The focus groups were recorded, transcribed and the data coded, analysed and written up. Interviews with key staff (for example Students’ Association representatives, Directors of Student Experience, Senior Tutors) from across the university to gather a range of staff perspectives. Interview data was treated in the same way as focus group data. From the information gathered from the literature, focus groups and interviews, the project team developed workshop materials designed to foster resilience. Design of a questionnaire, drawing on pre-existing materials such as the MTQ42 questionnaire, which students could complete before and after the workshop, with the aim of measuring any change in their attitudes towards resilience. A sample of students from each workshop group were also be invited to participate in a semi-structured interview, exploring their responses to the questionnaire more fully, and gathering richer qualitative data about the impact on their attitudes towards resilience. A full project report, including the questionnaire and interview data, workshop facilitators’ experiences and reflections, and data from the other stages. Key messages / strategies for building resilience in other career guidance interventions. Recommendations for wider applicability beyond the context of careers, into a more general academic setting. Conference paper and journal article.